What to see and do in Brazil's "Polynesia"
Ilhabela, or Beautiful Island, on Ilha de São Sebastião in the state of São Paulo, certainly lives up to its name. Discovered in 1502 by Amerigo Vespucci, the island has a long history of defending against foreign naval powers, serving as a pirate's refuge and smuggling base, involvement in black market slavery, and failed colonial efforts to establish sugar and coffee plantations. About 85 percent of the island’s almost 350,000 square miles is within Ilhabela State Park, a forest preserve where further development is not allowed. Most of the development is on the west coast facing the mainland, and the island’s economy is based on tourism. There are 35 kilometers of beaches, a coastal Atlantic rain forest, and a UNESCO Biosphere Reserve to explore mountain peaks to climb, and over 400 cool waterfalls cascading into the ocean to see. Add to those legends of pirate treasure, underwater wrecks to explore, great sailing (enough to make Ilhabela's annual Sailing Week a must) and you've got the makings of a fantastic vacation destination. From the top of Pico São Sebastião, the island's highest spot at 4,521 feet (1,378 meters) on the northern coast, you can look over the tops of trees to the water, catch a glimpse of local wildlife, and perhaps see, at the southern end of the island, the Ilhas das Cabras, part of the Santuário Ecológico de Ilhabela, devoted to the preservation of marine wildlife. From that vantage point, you can also see the other islands in the archipelago: Vitória, Búzios, Serraria, and Cabras. The archipelago is about 130 square miles total, with about 84 miles of coastline. Ilhabela is located 210 miles south of Rio de Janeiro and 138 miles north of São Paulo. From São Paulo, it’s approximately three hours by car to São Sebastião. From there, there's a 15-20 minute ferry ride to Barra Velha on the island, with bus connections to the hamlet of Vila Ilhabela, also called the Centro. This roadway access map will help you get oriented. Ilhabela is very popular with sailors, so there are marinas and guest berths available. There is a helicopter pad on the east coast, where you might also arrange a tour of the island. 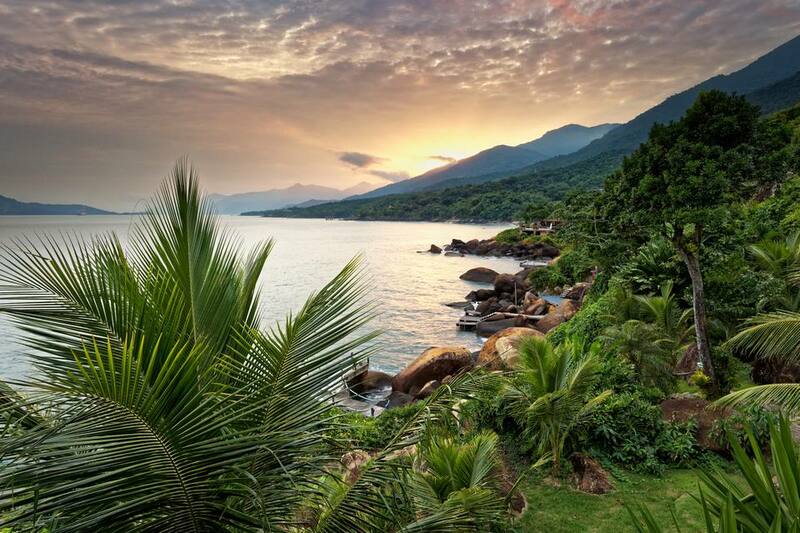 The average annual temperature is in the 70s F, which makes Ilhabela a year-round favorite. Summer or high season, as well as weekends, are crowded with people from the mainland. Offseason or during the week means less crowded conditions, although there are beaches where you can find a private spot for sunbathing or communing with nature most of the time. For diving, the best months are spring through summer, October to March. For sailors, the place to be is Ilhabela during Sailing Week in July when international sailors participate in races and regattas. Since the ocean between São Sebastião and Rio de Janeiro is popular cruising waters, there are numerous facilities for sailors. The west coast of Ilhabela is the most populated. Here you'll find hotels, restaurants, and people. For less crowded places, try the east coast where many of the white sandy beaches are wilder, isolated, and very scenic. Lodging is expensive on the island, so many visitors prefer to stay in São Sebastião and take the ferry, free to pedestrians, and spend the day on the island. Seafood, of course, is plentiful, and the Ilhabela prawns are reputed to be the best and sweetest. Ilhabela is an outdoor recreation paradise, particularly for aquatic sports. Sunbathing on any of the marvelous beaches is a great way to spend a more relaxing day. Don't forget your sunscreen and insect repellant. Although the numbers are decreasing, thanks to a control and eradication program, the tiny Borrachudo bug, somewhat like a mosquito, still can be a nuisance, particularly at dusk. You'll want to take advantage of the beaches, of course. The most easily accessible beaches on the west coast, near Vila, are Praia do Curral, Praia Grande and Praia Feiticeira where beach restaurants will keep you well supplied with food and drink, particularly caipirinhas, Brazil’s national drink which is made with sugarcane rum. Feiticeira, Sorcerer’s Beach, is reputed to hide pirate treasure. The most beautiful and unspoiled beaches are on the east side of the island but are more difficult to get to. Rough roads, and in some cases, only rough trails lead to them, and some are accessible only by boat. Praia dos Castelhanos is completely undeveloped and well worth the trip. The bay was once a pirate hideout. Legend has it that this is where British pirate Thomas Cavendish buried a fabulous treasure stolen from São Vicente village on Christmas, 1591. In town, visit the Igreja da Matriz, a beautiful colonial church built in 1908. On the way from the ferry, you’ll pass Fazenda Engenho D'água, a privately owned colonial plantation. While it is not open to visitors, you can get a glimpse of what Ilhabela looked like in sugar cane and coffee plantation days. Rent a horse to ride the mountain trails or gallop along Castelhano beach. Take a mountain bike to the steep, hilly trails. Go up the western slopes, then descend, stopping at any one of the many waterfalls, like Cachoeira do Gato on the way to tiny Praia do Gato. Rappel down a slope or along the waterfalls. Hike, trek or backpack in the state park to observe the diverse forms of Atlantic rainforest flora and fauna. You'll find a wide variety of orchids. Tours by Boat (Schooners or Yacht) will take you around the island with stops at beaches. Sail, or learn to sail with lessons from many of the sailing schools or yacht clubs. The São Sebastião channel is a perfect place to learn. Swim and dive. The southern end of the island is known as Brazil’s Bermuda Triangle for the number of shipwrecks. You might not see pirate ships or galleons carrying treasure back to Portugal, but there are many wrecks divers find intriguing. Surf at Castelhanos and Bonete. Bonete is easily accessible. Divers also enjoy the northern beaches of Fame, Poço, Jabaquara, Pacuíba, Serraria, and Portinho, Feiticeira, Prainha, Remanso, Indaiatuba, Anchovies beaches on the southern side of the island. The Ilhas das Cabras attract divers to view the underwater ecological sanctuary. Windsurfers like Ponta das Canas, Ponta Azeda, Armação, Pinto, Engenho Dágua or Perequê Beach, depending on the wind. You can go deep-sea fishing for marlin, tuna, or albacore. You can participate in catch, tag, and release fishing. Can You Survive Rainy Season in Central America?